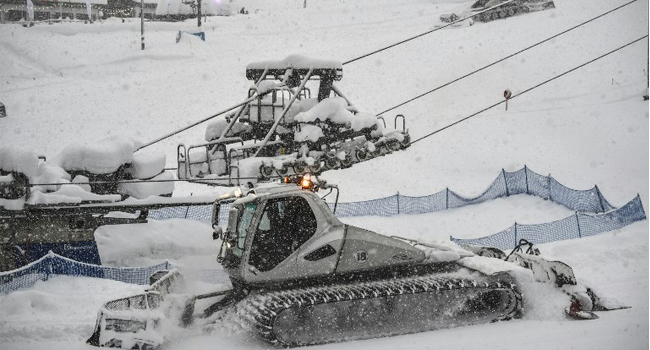 Snowcats clear snow on a slope during heavy snowfall at the Rosa Khutor resort on March 2, 2019. Organisers of the Women’s Alpine Ski World Cup were forced to postpone the Super-G race at Sochi’s Rosa Khutor slope on March 2 due to heavy snowfall. The event is now scheduled to take place on March 3. Organisers of the women’s alpine ski World Cup were forced to cancel the Super-G race in Sochi on Sunday due to unfavourable weather and course conditions. Russian alpine ski federation spokeswoman Olga Laeva told AFP that heavy snowfall overnight gave the organisers no chance to prepare the race track in time. “The snowfall ended too late,” she said. “We failed to remove it from the slope completely. On Friday heavy snowfall also forced organisers to cancel Saturday’s women’s downhill event at Sochi’s Rosa Khutor ski station.